Flo Hoylman: Short Lecture, Do the Maneuver, Switch Roles, Repeat, Q & A. This format worked great. You got to try the techniques with your own hands, feel what it was like to have someone do it to you, and got to watch with a check list. Joan Sheahan, FHA treasurer: I’ve often wondered what I would do if someone was in a situation where they needed help and I was the only person around… Now at least I know where to start!!! 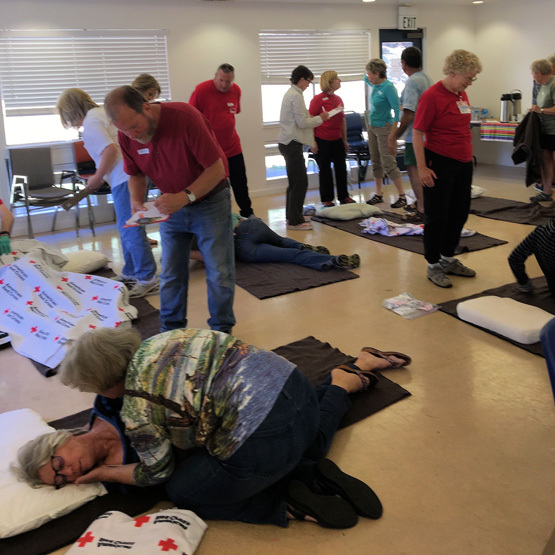 The recent 4-hour First Aid for Disaster Response (FADR) Class at the Marin City Senior Center on June 25 was a success. “Thanks to people asking their neighbors we had a great turnout,” reports Flo Hoylman, FHA Emergency Preparedness Chairperson, who organized the event. “Working together with neighbors was good and really reinforced that these basic first aid skills are what we will need most in an emergency.” Eight docks were represented. Of the 21 attendees: 9 board members, 4 people new to the docks and 8 others, including one member of a sister floating homes community (Greenbrae Boardwalk) who are getting going with Emergency Preparedness. Each module of the class was discussed first, then we broke into teams of 3 to practice under the supervision of MMRC volunteers—one of whom was Fiona Clements, the physician from Liberty. We each took turns being victim, rescuer, and scribe, keeping a checklist of all the steps to be practiced. Then we’d regroup for Q&A, before moving on to the next module. We had Starbuck’s coffee, water, pastries and fresh fruit available all morning, with a refreshment break about 11 AM, and an evaluation (very positive) around 1 PM. When asked what lingered most in her memory for the day, Flo replied, ‘”I feel more confident I can help in a medical emergency.” Flo’s already ramping up to enroll people to take a floating-home specific CERT class, with the 2nd day of simulated exercise to take place on one of the docks. Originally scheduled for June, the new dates are Saturday October 1 and Saturday October 8—8:30-5:30—location to be determined. The FHA covered the expense of the FADR training ($550) and will also reimburse anyone completing the 2-day CERT training ($45).